Luke lives just outside Carmarthen town and performs his magic regularly in the area. His magic is fun and completely baffling, the perfect combination for all social events. Luke is the resident close up magician at The National Botanic Gardens of Wales where he can regularly be seen performing his magic. Luke is a full time professional magician and offers a money back guarantee with his work. His prices are realistic and very competitive. Getting a quote could not be easier! Luke has worked for many businesses in the county including Carmarthenshire County Council who have used his services as a magician for a great number of events. If you would like a demonstration of his magical talents or would like to discuss any aspect of his work please get in touch or see him at a wedding fayre. Luke often attends wedding fayres in Carmarthenshire at The Halliwell centre and at The United Counties Showground. Please visit the other pages on his web site for more testimonials and photos showing what he can offer. 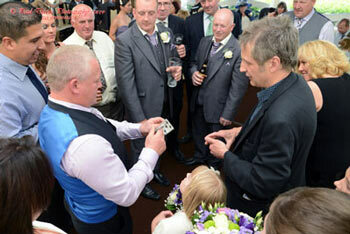 Luke has been performing magic throughout the UK and abroad for over twenty years. During this time he has performed in theatres and on television.